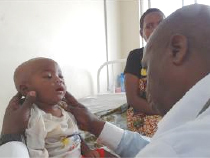 This child came to Buguruni Anglican Health Centre with a high fever, malaria, and a history of two seizures. He is being seen by Dr. Ernest, one of the clinical officers. The child was lethargic and had diarrhea. He stayed lethargic and his fever did not go down until he was given antibiotics for possible meningitis, in addition to his malaria treatment.